How can this be happening? This seems to be breaking laws of Physics. My Son a year ago started working for a PV Installer. And we were talking about installing some here. I started talking about getting every watt possible for the install, so mentioned about making a tracking system. He said with these new panels tracking is not necessary! The tiny amount of gain is far lost in the cost of making the panel(s) move and tracking controller/motors/etc. Then he showed me some data. A Chart showing the output of one of the systems. And it makes absolutely no sense to me! OK, the Sun is supplying us “X” amount of power per square meter. Say for figuring purposes and to keep this simple say 1 Kilowatt. Also lets say the panel is 100% efficient too. A 1 square meter panel perfectly aligned to the sun, is making 1 kilowatt of power. Now as the Sun moves it is off axis to the panel, and because of this the panel is gathering less than the 1 square meter bundle of solar energy correct? Say the Sun is at 45 degrees off axis. The solar bundle is now only 70% of a Square Meter. Taking this to an extremes here now the Sun is almost 90 degrees off axis, it is directly to the side of the panel and the Sun is just barely touching it. Another minute or two, and the Sun will be behind the panel. And in theory the panel should have almost zero output correct? OK I will grant it, it probably still gets some power from the bright sky scattered light. But I can not believe THIS MUCH! Examine the photo that shows the power generated by this array. It is the typical array. Panels fixed looking due south, tilted to maximize for the best yearly generation. Slightly above the Equator. It is for July 8th. As seen it says for that day power started to flow at 5AM. This is incredible, and it must be collection the dawn light, because the Sun does not even rise till 5:30! What is even more amazing is, with the panels facing due south,,, Till the Sun gets more south in Azimuth than 90 degrees, the front of the panels do not get any direct Sun energy, The Sun is actually BEHIND the panels till it gets 90 degrees east or more south! And the Sun doesn't hit 90 degrees till 8:48! Now at 8:48 the Sun is totally just glancing the panels, the bundle of energy is like nothing correct? Yet look at the power generation! It's making almost 200 kilowatts already it is very close to max generation! HOW!? It stays at this max power, and again in the west when the Sun is at 270 degrees, the same situation, the Sun is barely hitting the front of the panels, at 5:12PM, yet it is still almost max power. How can this be? Then from that point from 5:15 till Sundown at 7:18 the front of the panels are only getting scatter light the Sun is behind the panels. In that chart the panels are still making power 45 minutes AFTER SUNDOWN! This makes no sense to everything I have ever learned about Solar energy! A tracking system WILL improve performance when the sun is low as the panels will be tilted to catch more sun. HOWEVER the COST of the tracker is more than you will gain. Then there's maintenance, storm protection, etc. Back when PV panels cost $10 or so a watt it made sense, now it's cheaper (and easier) to simply install more panels to make up the difference. It's all about the money. Panels are getting better and better at harvesting oblique energy. 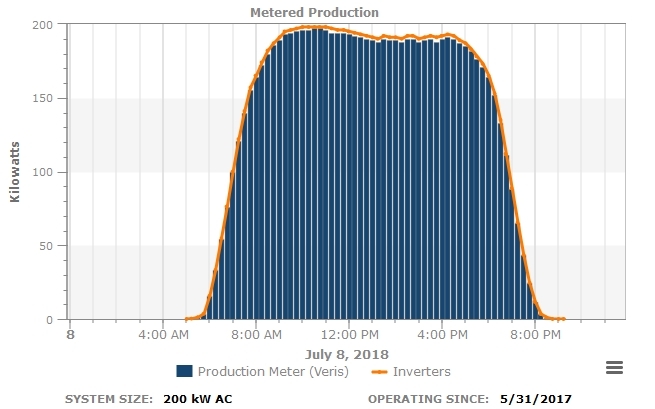 However I suspect the system in the graph has undersized inverters, and the midday power is being "clipped". Why? Probably again, money. Also bear in mind that PV panels do NOT require direct sunlight. As long as the sky is bright, they will produce, even on overcast days. I had a homemade tracker a few years ago, it did NOT always track the sun. Instead it tracked the brightest part of sky, where the energy was. I doubt this was undersized in any way. This was a professionally installed system, with a bottomless budget to make it happen, It is a local power companies solar farm. It is economics not technical. For the cost of installing and maintaining a tracker. One could install more panels and get a bigger productivity increase. Some technologies do a pretty good job of getting power from the bright sky. Also if the panels are near horizontal, the azimuth of the sun doesn't matter that much. The sun can be considerably north of east or west and still shine on the panels once above a certain altitude. It's all a matter of geometry. TECO in Florida DOES use tracking arrays and they claim they are cost effective. The axis of the trackers are horizontal and track only east to west. Each unit may have 50 or more panels and several units may have a common drive. It's big, yet simple.